Coinciding nicely with their latest release of Shostakovich quartets (nos. 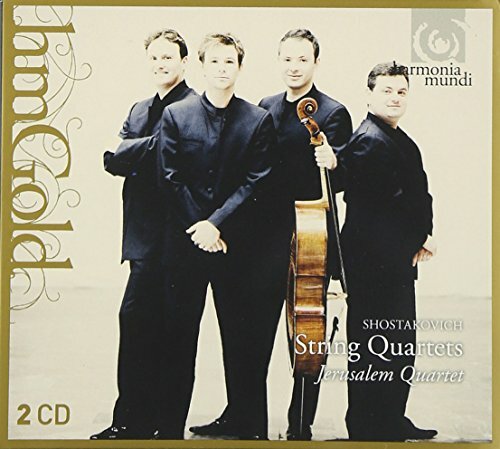 1, 4, and 9) on Harmonia Mundi, the Jerusalem Quartet hit the Kennedy Center this Wednesday with an entertaining program in the Terrace Theater. 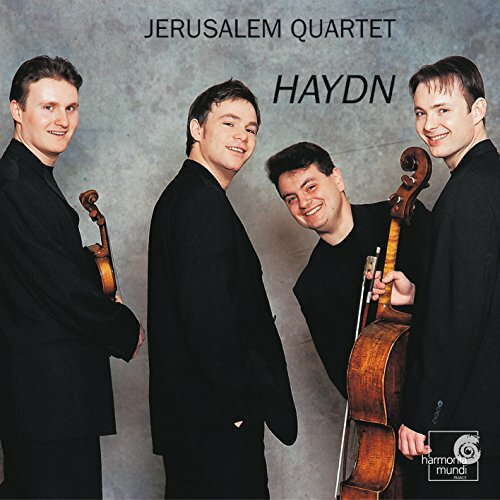 Starting with Haydn's Sunrise Quartet (op. 76, no. 4, in B-flat major) the four players, Alexander Pavlovsky, Sergei Bresler (1st and 2nd violin), Amihai Grosz (viola), and Kyril Zlotnikov (cello), showed at some moments why they are one of the most promising quartets these days. Their two recordings at least are very promising. In the Shostakovich I have not heard that much zest since the Borodin (especially in their Melodiya cycle), and while I am Quatuor Mosaïques-obsessed in Haydn, their recording is near the top of the heap, also. In contrast to those endeavors, the Haydn in concert was certainly not perfect, something I'd only expect from the Emerson (performing next Thursday at Strathmore, where Ionarts will hear them) in any case. It did have some vitality, though—one of the most important elements in Haydn. The "Sunrise" theme was lyrically phrased, although better intonation would not have hurt. The Andante came with beautiful and melodic touches; the Menuetto: Allegro was a tad heavy-handed. The Finale: Allegro ma non troppo was brisk and almost exciting. Dvořák's "American" quartet (nothing American about it, of course) is so popular in this country because of its nickname but should be just as popular on its musical merits alone. The four young musicians' interpretation was full of idiosyncratic little touches, aggressive and a little thin here, fat and bold there; not my favorite way to hear it, but a good deal better than the Haydn. Cellist Kyril Zlotnikov's contribution was particularly pleasing, but what was lacking is the natural touch that the Pražák or Chilingirian Quartets bring to Dvořák. Beautiful as certain phrases were, they also sounded self-conscious on several occasions. In the Finale: Vivace ma non troppo the foursome bravely ignored the ma non troppo part and played the heck out of the music. While it only underscored the mentioned caveats regarding their performance, I also found myself enjoying the different approach of an oft-heard piece. It's not an interpretation that might please in repeated hearings on disc, but its impact in a one-time live performance turned out to be very entertaining. The audience, predictably, loved it and coaxed an encore (Haydn's finale from quartet op. 76, no. 6) out of the group. (Did no one tell them that standing ovations are meaningless in North America?) The encore was driven by speed demons, Haydn via Shostakovich. Altogether, the recital—thanks to Shostakovich—was a worthy cap on this season's Kennedy Center Fortas Chamber Music Concerts series and a good argument to subscribe for what is coming in 2005–2006, e.g., Peter Serkin, the Guarneri SQ4t, the Kalichstein-Laredo-Robinson Trio, and Trio Mediaeval.